The First-Year Experience Office supports every single first-year student as they make The University of Texas at Austin their new home. The peer mentor position offers exception students the opportunity to be both leaders on campus and mentors to new students. Mentors are committed to helping their students adjust to life at UT. Participate in a 360 Connection, a small group of first-year students who meet regularly, and start your experience on the Forty Acres as part of a supportive community. Join a First-Year Interest Group and take two to three courses with other new students who share your interests. Your FIG will also have an undergraduate mentor and a staff member to help you throughout the semester. Even on the first day of school, you will have friends sitting next to you in class. 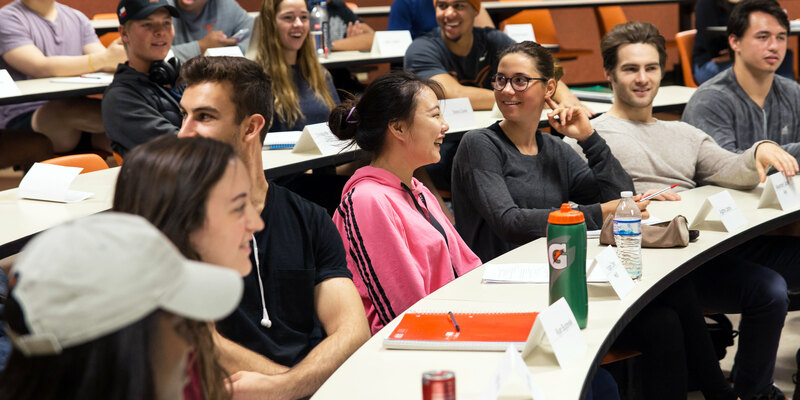 Connect with top-level faculty during your first year on campus in your Signature Course (UGS 302 and UGS 303). Offered on a variety of topics, these rigorous, interdisciplinary courses help students transition to college-level academics and introduce valuable university resources. The Transfer-Year Experience Program creates a seamless academic transition for undergraduate transfer students. We facilitate first-year transfer student engagement through transfer student Signature Courses and Transfer-Year Interest Groups. We’re the place to go with questions about the core curriculum and the transition to campus. We want to hear from transfer students as they make UT Austin their new academic home. Engage in a campus conversation with leading faculty and other first-years at the University Lecture Series. This showcase of nationally and internationally renowned scholars, scientists, and civic leaders is generously brought to UT by the Audre and Bernard Rapoport Excellence Fund for Undergraduate Studies.